EZ Web Lynx development kits help get your products to market fast. 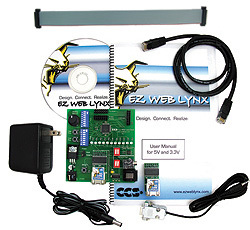 Low cost development kits include all hardware, software and documentation needed to speed integration of EZ WEB LYNX modules into your design. Monitor and control analog and digital I/O on the docking station using custom HTML tags. Use the IDE to develop custom dynamic web pages and send alarm/status emails simply by programming in HTML. Complete documentation includes design examples for temperature monitoring, using conditional HTML tags and controlling pin I/O.